Elaine of Astolat, a character closely related to the Lady of Shalott, is an innocent maiden who falls deeply in love with Sir Lancelot. When he does not return her love, she dies of grief and floats in a barge down the river to Camelot. Elaine’s story is found in important works of literature by authors such as Malory and Tennyson, and she is also frequently represented in artwork. A favorite of illustrators, dead Elaine in her barge is a recurring theme among many artists, especially the pre-Raphaelites. In fact, Elaine seems to be an even more popular figure among the Victorians than she was in the Middle Ages. Her youth, pure love, and death aroused widespread admiration and pity in the Victorian audience. Though she is often critiqued by feminist critics as a passive figure, most versions of her narrative also give her some authorial control over her story, even as she remains a victim of hopeless love. Some contemporary versions of her story for younger readers attempt to rescue her from the role of victim and make her a more active figure. The story of the doomed maiden from Astolat appears in the “La Damigella di Scalot,” tale 82 of Il Novellino, a thirteenth-century collection of Italian tales. The Lady falls in love with Lancelot and dies when he does “not wish [voleva] to return her love” (109). The wording here indicates that Lancelot had some choice in selecting a lover and thus renders him more culpable than in later versions. Although the lady seems to have little control over her death, as “death came to her,” she does have considerable control over the manner in which her dead body will be presented to the court (109). Before dying, she orchestrates a lavish ship to carry her body to Camelot and commissions a letter explaining her death. The tale explains that “her instructions were executed exactly as she had said” (109). Despite the lady’s specific design, her journey requires some faith in that she plans for her corpse to be left without sail or oarsman in the sea and must assume that the waves will bring her to Camelot. 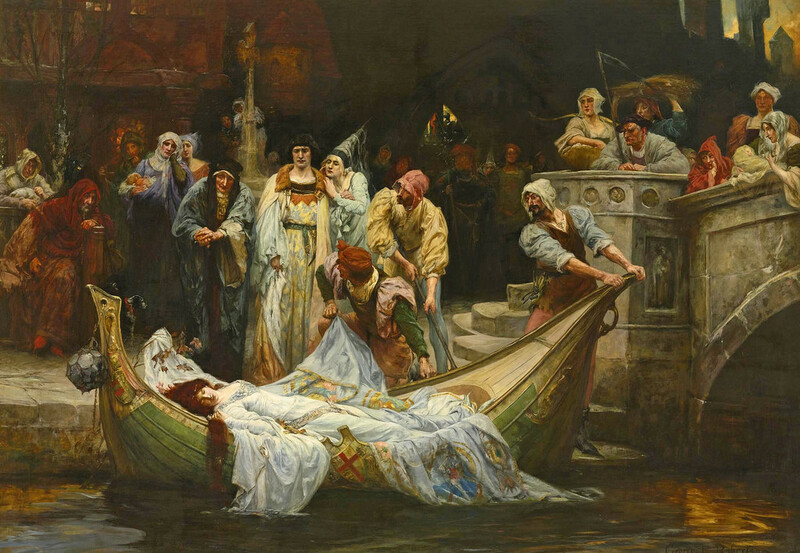 Whereas other versions of the story imagine the maiden floating down a river, where she can count on the currents to bring her to her destination, Il Novellino’s depiction of the lady coming to Camelot by sea lends the death journey a sense of fate. The final words of the tale are those of the lady's letter, which calls Lancelot “the best knight in the entire world, and the cruelest one” (111). The French Elaine story from the Mort Artu (in the Vulgate Cycle/Lancelot-Grail Cycle), also written in the thirteenth century, goes into much more detail than the Italian version does. Whereas Il Novellino gives us the bare facts of the tale and presents it in isolation from a larger story of the Round Table, the Mort Artubegins a tradition of extending the maiden’s sad tale and placing it in the context of a larger narrative. This version of the maiden is much more calculating than other Elaines tend to be. She tricks Lancelot into wearing her favor by first asking for an unspecified boon, and only reveals her wish once he promises to grant it to her. She tells him that he has agreed to wear her sleeve and “do battle for the love of me” (93). Lancelot is “displeased by the promise,” since the queen will surely be angry, but he must keep it anyhow “for it would be dishonorable for him not to do just what he had promised the young woman” (93). The Mort Artu thus presents the lady as actively manipulating Lancelot into granting her desires and shows Lancelot struggling with an impossible situation on account of the maiden’s clever ploy. Her denunciation of Lancelot’s actions continues in the letter she has placed with her corpse, so that the whole Round Table will blame him as well. In this version, we do not see her preparations for death. Instead, King Arthur and Sir Gawain see a boat float up with her body in it and find her letter, which explains that she “suffered the pain of death … for the most valiant and yet the vilest man in the world: Lancelot of the Lake” (114). The king responds with sympathy for the maiden and anger at Lancelot, claiming that “‘the wicked thing he did to you is so terrible and so despicable that he should be condemned by all’” and suggesting that they “‘inscribe her tomb to explain how she died, so that those who come after us will remember her’”. Not only does the king provide for her funeral, but he has the maiden “buried in the main church of Camelot” with the inscription “HERE LIES THE MAIDEN OF ESCALOT, WHO DIED FOR LOVE OF LANCELOT” . In other versions of the story, the maiden takes on the role of healer when Launcelot is wounded in the tournament, but in this version the earl’s son tends Launcelot with his aunt. Texts that position the maiden as Launcelot’s healer put him in a position of indebtedness to her for her help. This version, then, gives us no reason to see Launcelot as misleading or owing the maiden in any way. Yet when Gawain arrives, the maiden tells him that Launcelot has taken her for his lover. If she had said that he was her beloved, her words could be construed as accurate, since she does love him, but instead she claims that he has taken her “[f]or his leman” [for his love], and there is no ambiguity in her statement (line 582). It is difficult to understand her motivations, and perhaps she was simply believing what she wanted to believe about Launcelot’s wearing of her favor, but it is not Gawain who misrepresents the situation in this version, but the maiden herself.